An organisation is only as good as its employees, and up-skilling your staff is one of the smartest investments you can make in your business. Businesses that devote a portion of their budget to building capability often report higher levels of productivity and lower staff turnover. Business Central is a recognised leader in management training – regarded as the authority in the fields of employee relations, occupational health and safety, and people management. Our studies show that after attending our seminars, participants have gone on to demonstrate greater morale and increased commitment to enterprise objectives and success. We provide practical training solutions that reflect the needs and challenges faced by employers every day - our trainers focus on common sense approaches to handling real-life situations. We recognise that with training solutions, one-size doesn't always fit all. So we can easily adapt our training courses to meet your individual needs. Our seminar series can also be provided in-house. Our trainers and organisers are outcome-focussed, and will do whatever they can to get you the results you're looking for. COURSES IN THE CENTRAL REGIONBusiness Central offers a range of development courses designed to help your employees grow in every direction. IN-HOUSE TRAININGWe'll come to you! 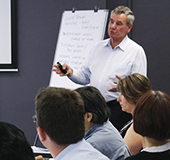 Get customised & tailored training that meets your organisation's specific requirements. COACHING & FACILITATIONOur performance coaches and facilitators can provide a number of benefits to your organisation. NETWORKING EVENTSDiscover what networking events are happening in the Central region. Meet like minded peers & form new business connections.